This important volume affords a panoramic view of local elites during the dramatic changes of late imperial and Republic China. Eleven specialists present fresh, detailed studies of subjects ranging from cultivated upper gentry to twentieth-century militarists, from wealthy urban merchants to village leaders. In the introduction and conclusion the editors reassess the pioneering gentry studies of the 1960s, draw comparisons to elites in Europe, and suggest new ways of looking at the top people in Chinese local social systems. Chinese Local Elites and Patterns of Dominance lays the foundation for future discussions of Chinese elites and provides a solid introduction for non-specialists. Essays are by Stephen C. Averill, Lenore Barkan, Lynda S. Bell, Timothy Brook, Prasenjit Duara, Edward A. McCord, William T. Rowe, Keith Schoppa, David Strand, Rubie S. Watson, and Madeleine Zelin. Joseph W. Esherick is Professor of History at the University of California, San Diego and author of The Origins of the Boxer Uprising (California, 1987). 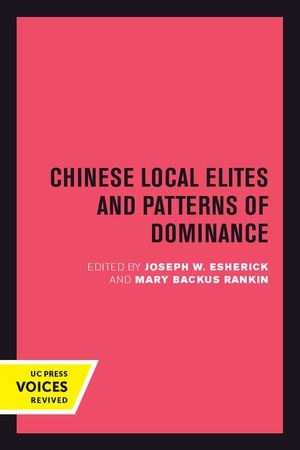 Mary Backus Rankin is the author of Elite Activism and Political Transformation in China (1986).